DS Automobiles has been announced as the brand partner for premium outdoor media owner Ocean Outdoor’s exclusive coverage of the ABB FIA Formula E Championship. In a multi-screen outdoor and TV broadcast deal brokered by Mediacom and the Infinitum Entertainment Group, DS Automobiles becomes the commercial sponsor of Ocean’s race coverage for the season that concludes with a double-header finale in New York. Coverage on 14 Ocean screens in nine UK cities continued this weekend with spectacular coverage of the first European race which took place in the streets of Rome on Saturday (April 13). Eleven teams and 22 drivers are competing in the 2019, Formula E Season 5. Last November, Ocean became an official media partner of the ABB FIA Formula E Championship, in an exclusive out of home partnership. DS Automobiles participates in the ABB FIA Formula E Championship as DS Techeetah, racing the DS E-TENSE FE19. The team won the 2017/2018 Drivers’ Championship title with Jean-Éric Vergne and together with André Lotterer, the team secured second place in the Teams’ Championship in the 2017/2018 season of Formula E.
The other teams competing in Formula E are Audi Sport, Envision/Virgin Racing, Dragon, Panasonic Jaguar Racing, Mahindra Racing, BMW Andretti, Nio, HWA, Nissan and Venturi. The Formula E circuit moves to Paris on April 27, then Monaco (May 11), Berlin (May 25) and Bern (June 22), ending with a dramatic double race finale in New York on July 13 and 14 when the all-important championship title will be decided. London returns to the Formula E calendar as a host city in summer 2020 when the E-Prix takes place around the Royal Docks and ExCel London. 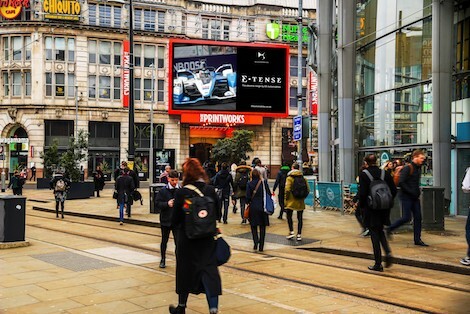 This entry was posted on Monday, April 15th, 2019 at 03:16 @178 and is filed under DailyDOOH Update. You can follow any responses to this entry through the RSS 2.0 feed. You can leave a response, or trackback from your own site.